The Movement for Reform Judaism continues the intellectual and spiritual development of Reform Judaism with liturgy, publications and inspiring resources enhancing our Jewish lives. We currently have three different prayer books available to buy: the Days of Awe or High Holy Days machzor, the Pilgrim Festivals prayer book and Seder Ha-T’fillot, Forms of Prayer – the daily and Shabbat Siddur published in 2008. In addition our first ever Haggadah – the text which sets out the order of the Passover seder was published in 2014. Our publications reflect our values; they use translations in gender-inclusive English and feature accessible transliteration. Find out about our new draft Rosh Hashanah morning Machzor and be part of the process of creating our High Holy Days prayer book. 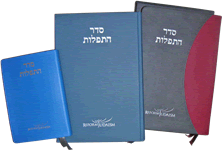 The Reform Movement currently has three different prayer books available to buy: the Days of Awe machzor, the Pilgrim Festivals prayerbook and Seder Ha-T’fillot, Forms of Prayer – the daily and Sabbath Siddur published in 2008. 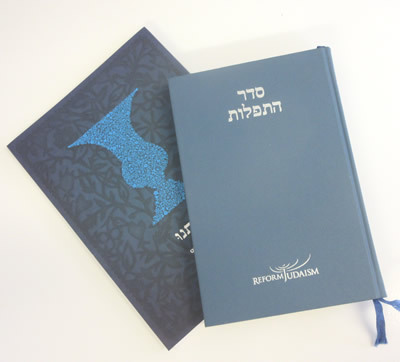 Seder Ha-T’fillot, Forms of Prayer – our Siddur is a highly innovative prayer book which includes services for Shabbat, weekdays, festivals and special occasions. Its flexible format enables you to participate in the most traditional or creative style of service. In new and extended sections, the Community Prayers, Calendar of the Year, Lifecycle Events and Home Services provide a wealth of material for both public and private occasions. Contemporary issues, such as social justice and the environment, are addressed in specially-commissioned prayers and there is also new material offering more musical opportunities to enhance services. Our first ever Haggadah – the text which sets out the order of the Passover seder – is now available. ‘Haggadateinu’ – ‘Our Haggadah’ features an attractive, user-friendly layout including transliterated Hebrew. It embodies our core values and will provide an engaging, enjoyable seder for anyone who uses it. The latest reprint also features an enclosed ring-binding, meaning it looks attractive on your bookshelf whilst being easy to use at the seder table. ‘Haggadateinu’ is produced by the rabbinic publications team under Rabbi Paul Freedman of Radlett & Bushey Reform Synagogue with Rabbi Yuval Keren. The text is the work of an earlier working group chaired by Rabbi Alexandra Wright which included Rabbi Colin Eimer, Rabbi Dr Michael Hilton, Rabbi Neil Kraft, Rabbi Elizabeth Tikvah Sarah and Rabbi Dr Reuven Silverman. It features illustrations by Hertfordshire-based folk artist Suzy Taylor whose papercuts are meticulously cut with a blade from a single piece of paper. Rabbi Paul Freedman says: “The publication of our own Haggadah is a significant moment for the Movement. The themes of the festival of Pesach: freedom leading to responsibility and social action are core values of Reform Judaism. 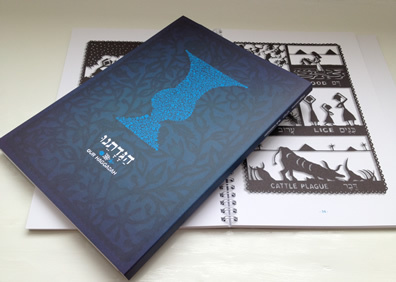 It’s therefore incredibly exciting that at last we will have our own beautifully illustrated Haggadah reflecting our deeply-held beliefs”.